[Transistor-Man] and the gang finally got around to documenting their experience at the Detroit Makerfaire 2014 and the Powerwheels racing series. They weren’t planning on entering, but in a last-minute decision they decided to see if they could whip up an entry just over one week before the competition! They did — and it’s awesome. They call it the Chibi-Atomic-Jeep. As the competition name implies, they had to base the vehicle off of a Powerwheels frame. Bunch of steel tubing, some TIG welding and a nice paint job, and they had the base frame of their vehicle. At the heart of it? An alternator from a van — surprisingly powerful and easy to control. They used cheap 8″ wheels from Harbor Freight Tools — they worked great, just didn’t last very long… By the time the races were over, they went through NINE of these tires. Good thing they’re cheap! The most impressive part of the build is the gears. They made them using a water-jet cutter at the local hobby shop and a Bridgeport mill with an indexing head — not an easy task to complete! The real story here is their persistence at reverse engineering. The PCB was folded like a cardboard box to fit in the original case, making large portions of the circuitboard and wiring inaccessible. Even when they managed to trace the signal to what they thought was the appropriate chip (marked C80580), they could not find any information on the 30 year old chip. Noting that every other chip on the board was Panasonic and started with “AN5”, [Igor] suspected the mystery silicon was just renamed and went through every single datasheet he could find with that prefix. Combined with form factor, pin count and purpose, his sleuthing was rewarded with a guess for a match – the AN5715. His hunch was correct – using that datasheet led him to the answers they required. This past Saturday was the first Mini Maker Faire held in Poughkeepsie, NY. Although it was the first in the area, the event went extremely well having over 60 makers and countless attendees. It was held at the Poughkeepsie Day School and made use of a large percentage of the indoor area. Ninth graders of the hosting school [Liam], [Johnson] and [Matt] were proudly displaying some of their projects. One of which was a robotic hand controlled by a glove the user wears. Flex sensors sewn into the glove detect how much each finger is bent. That information is read by an Arduino which then commands 5 independent servos to pull string ligaments to bend the fingers of the 3D printed robotic hand. The kids give credit to this Instructable which was the inspiration for their desire to build such a project. No Maker Faire would be complete without some 3D printers. On hand was a father/son team that built a Mini Kossel. The design is simple and elegant, and apparently assembly is no problem for even the youngest maker. 3D printing guru [Ed] was on hand with his MakerGear M2 to show some practical uses for 3D printers. They are not just for making Yoda heads! [Ed] also gave a presentation on the matter, explaining why 3D printing is important and useful to people, even the common non-techno-nerd consumer. As the Jerusalem mini Makerfaire approached, [Avishay] had to come up with something to build. His final project is something he calls ASTROGUN. The ASTROGUN is a sort of augmented reality game that has the player attempting to blast quickly approaching asteroids before being hit. It’s definitely reminiscent of the arcade classic, Asteroids. The primary difference is that the player has no space ship and does not move through space. Instead, the player has a first person view and can rotate 360 degrees and look up and down. The radar screen in the corner will give you a rough idea of where the asteroids are coming from. Then it’s up to you to actually locate them and blast them into oblivion before they destroy you. The game is built around a Raspberry Pi computer. This acts as the brains of the operation. The Pi interfaces with an MPU-9150 inertial measurement unit (IMU). You commonly see IMU’s used in drones to help them keep their orientation. In this case, [Avishay] is using it to track the motion and orientation of the blaster. He claims nine degrees of freedom with this setup. The Pi generates the graphics and sends the output to a small, high-brightness LCD screen. The screen is mounted perpendicular to the player’s view so the screen is facing “up”. There is a small piece of beam splitting glass mounted above the display at approximately a 45 degree angle. This is a special kind of glass that is partially reflective and partially translucent. The result is that the player sees the real-world background coming through the glass, with the digital graphics overlaid on top of that. It’s similar to some heads-up display technologies. The DIWire bender we saw last summer made its way to Maker Faire this year with a new and improved version that is now able to bend steel even more accurately than the previous aluminum-bending version. I chatted up [Marco Perry] (above, obviously), and he explained a new feature of the DIWire bender that makes soldering or welding creations made out of CNC bent wire even easier. The new machine features a sharpie that precisely marks where the wire should be welded. The folks behind the DIWire – Pensa – have a ton of really cool wire sculptures at their booth at Maker Faire, quite incidentally within spitting distance of Hackaday’s Red Bull booth. Be sure to check them out if you’ve got a chance. 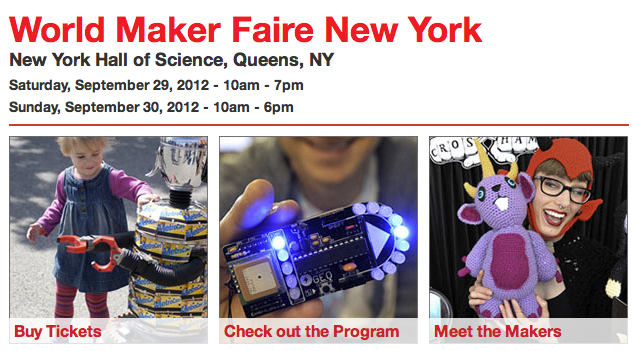 For the next two days, [Caleb Kraft] and [Brian Benchoff] will be wandering around the World MakerFaire in NY. Primarily stationed at the booth meant to show off our winning entry into the Redbull Creation contest, we hope to find some interesting things for you to read about. We’ve already scoped out the MakerFaire and met a few people so we’re eager for the gates to open today and let in the flood of enthusiastic people. Speaking of floods, its been raining quite a bit so we’ve got our fingers crossed that we’ll get some clear patches so we can enjoy the things that require a little more space, like the “Centrifury” from North Street Labs. While everything is going on here, it can be hard to sit down and write a worthwhile article, so those probably won’t appear until monday. In the meantime though, we will be uploading random amusing things as we find them to our youtube account.